In 2009 one an ACPillsbury Foundation Associate notices the photos used below, then prominently displayed online in the California State University Library, Madden Special Collections. These were strikingly different from the balance of the Harry Pidgeon Collection, in which they were included. As you see below, they are groupings of VIPs all of whom are associated with Yosemite National Park. All photos were taken with the individuals posed on Redwoods in the Mariposa Grove. This was only the first oddity. The next was equally striking. The photos had been transferred to the Madden Special Collection, attributed to Harry Pidgeon from the Yosemite Museum, Yosemite National Park in 1966, (See Transfer Document ). 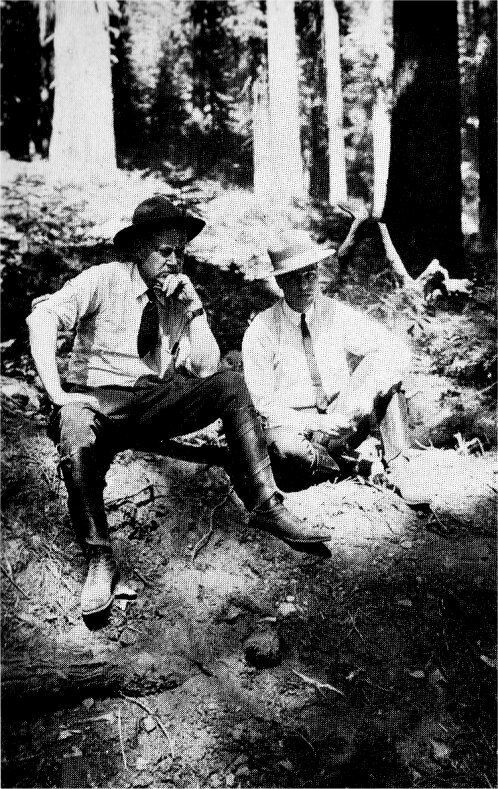 Individuals who were photographed together in include Horace Albright, William Colby, Don Tresidder, Stephen Mather, Ansel Adams, Washington B. Lewis, then Superintendent for Yosemite, possibly Gifford Pinchot and Charles R. Trowbridge. The Official Photographer for Yosemite at the time of the dedication of the Ahwahnee Hotel in July of 1927 was Arthur C. Pillsbury. These photos are strikingly like his work and show his facility to obtain natural, relaxed poses with his subjects. Harry Pidgeon's work, which included logging, family, home, and water resources, can be viewed HERE . These links no longer work and the photos are no longer online or attributed to Harry Pidgeon as of 2017. And while “Person of Interest” (D) remains unidentified, he does bear a striking resemblance to the young man just in back of him (C). As you read through this analysis keep in mind that these photos could only have been taken by Arthur C. Pillsbury, the Official photographer for Yosemite. Pillsbury had not received this position because he made it possible through his lectures and films for Mather to achieve the financial stability of Yosemite National Park despite the impact of his felonies, which included self-dealing. For this he had brought in J. Desmond to build out high end resort facilities in Yosemite. The need for this level of hospitality was unjustified by any reasonable analysis of the usage. People who went to Yosemite understood they were camping and did not expect Five Star amenities. Read the facts about Stephen Mather. His wealth was not earned, but stolen through fraud. Horace Albright knew this and confessed to this knowledge in his book, "Creating the National Parks - The Missing Years." Albright covered for Mather for as long as Mather lived and then carried out the cover-up which continues to this day. The reason for this went beyond avoiding prosecution for the conspiracy which, since it involved the deaths of some of their targets and grave damage to other individuals, has no statute of limitations. Albright was an attorey whose career included major positions in extractive industries. He held stock in US Borax inherited from Mather. William Colby's real career was as an attorney serving extractive industries. Both men have done all possible to hide their real lives while positioning themselves as 'conservationists.' In this usage this means holding resources until they are needed. It appears their real employer was not the NPS or the Sierra Club but the National Reserve System, which needed these reserves for the time their Ponzie scheme would fail. That is happening now. Colby joined the Sierra Club in 1898, the year of his graduation from law school. He served as the club's representative in the Yosemite Valley area. In 1900, he became the club's secretary, and served (bar two years) in that post until 1946. He also served as a director of the club for 49 years. At the same time Colby was making his living as an attorney defending extractive industries. Horace Albright took classes from him at Berkeley while studying the same specialization. Both men were careful to evade having it known they were engaged, professionally, in support functions for extractive industries. Albright was, at this time, working for US Borax. Albright also worked as an assistant for Adolph Miller, one of the individuals responsible for setting up the Federal Reserve System, run by individuals who were well aware they needed access to natural resources and that a separate organization, not answerable to the Federal government, would advance their control over these resources. Today the National Park Service remains beyond the control of the Federal Government. Colby was a pioneer in the Sierra Club's outing program, and led his High Trips to the Yosemite area from 1901 to 1929; he also led the 1928 High Trip to the Canadian Rockies, and at the end of that trip was given a heartfelt fireside tribute by his fellow hikers, who included 26-year-old photographer Ansel Adams. Colby was well aware that Stephen Mather wanted to exxcise the memory and work of the only man who actually advanced the understanding of the natural world in their time, Arthur C. Pillsbury. (Possibly Julius Boysen?) wearing a bow tie. The final “Person of Interest” photographed within the “womb” of the Grover Cleveland Tree is the unidentified Bagpiper ..... who appears in quite a number of other photos from the same Henry Madden Library.